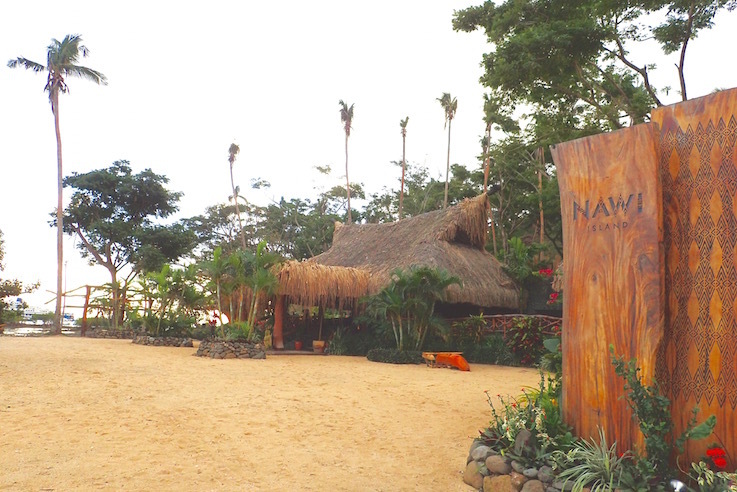 Nawi Resort's very welcoming waterside entrance. Savusavu, Vanua Levu, Fiji. Savusavu Fiji is a great place to provision, eat out (if you're into that -- but we're not), and connect with wide and wonderful cruiser network. Sadly, Savusavu is not all that great for beaches, snorkeling or hiking, my favorite -- and free! -- cruising activities. Tauntingly, just across from Savusavu's Copra Shed and Waitui Marina's moorages beaconed a lovely resort, Nawi, with a fancy boat (well, to us, dinghy) dock, a beautifully landscaped entry with Polynesian-style statues, broad walkways and the closest thing we'd seen in Savusavu resembling a beach. At night, the resort took on an almost dream-like appearance, dramatically light. All private, we heard. We were intrigued. We were hot. We were also a little bored. Given our rascally, adventuresome nature, one steamy afternoon we* decided to check it out, and ask forgiveness not permission if the unwelcome mat came out. *We: Wayne and I, Steve and Patty of Armagh and Chris and Meaghan of Tangatatu. 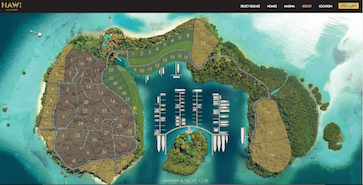 Just a few steps beyond the dock and the men in orange shirts appeared, politely but firmly pointing out Nawi island was a private resort and construction site. No one was allowed without prior permission. 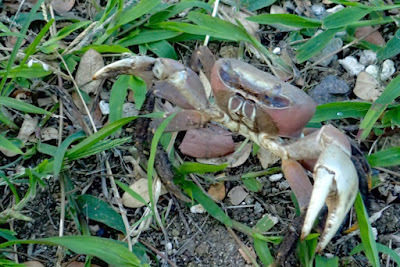 Whist Patty turned on her charm, undaunted, I asked, "How does one get permission to come ashore?" The nice fellow pointed us to Violet, whose office was in Copra Shed's complex, upstairs. So we visited Violet. Diplomatically, she suggested we visit the island at sunset, as that would keep us out of the construction work, and would be a nice time to enjoy the resort. We thanked Violet, and told her we'd take her up on her "invitation" the next eve. She promised to call the folks minding the resort site to let them know she cleared our visit. 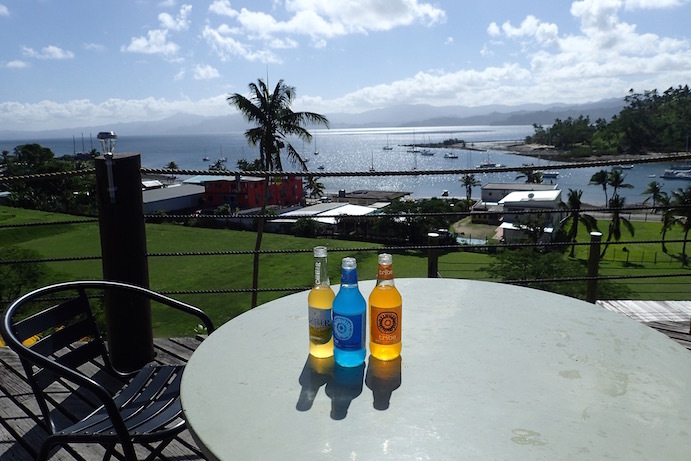 Our price to play - drinks - at Hot Spring Hotel, Savusavu, Fiji. That afternoon, Steve and Patty and Wayne and I invited ourselves to the Hot Springs Hotel pool, which, contrary to its name, does not have a hot spring. It is right across the street from some hot-spring fed mineral baths, a very plain-Jane affair for $15 FJD (about $7.50 USD) trio of concrete cube-shaped baths under a covered concrete patio. The baths are filled and heated (and cooled) to about 104F. 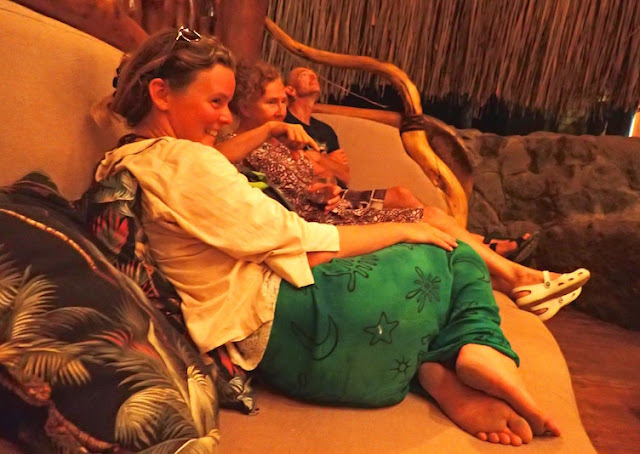 There are some nice Zen touches... bamboo decor and some colorful yet restive fabric touches, some flower petals in a large clamshell and a garden view, recovering from cyclone Winston's damage. The income from the baths helps fund community medical assistance provided at the same site. 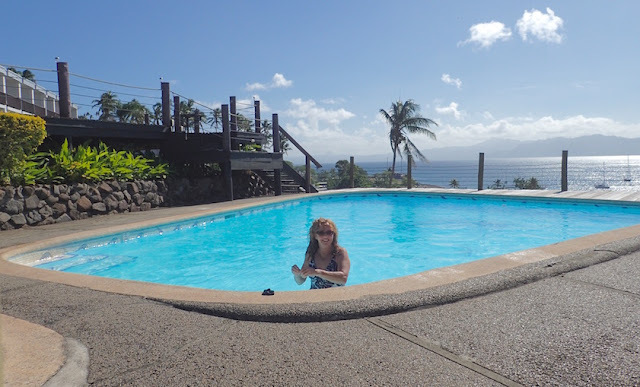 Bathing beauty Patty of Armagh cools off at Hot Springs Hotel's pool. Savusavu, Fiji. Hot Springs Hotel offers a terrific territorial hilltop view of Savusavu from its expansive patio, complete with (limited) drink options, chaise lounges and an inviting swimming pool and a kiddie pool. As non guests, our "fee" for enjoying the pool and its surrounds was a drink, provided there weren't many guests present. In fact, we had the whole area to ourselves until the last half hour or so. Permission granted this time, we saunter unfettered onto Nawi Resort's grounds just a bit before sunset on a less blistering day. Savusavu, Vanua Levu, Fiji. The next eve our merry band on dinghies made way with permission to Nawi Resort, drinks in hand. Nawi, posh as its private entrance may be, is also at this stage, far more dream than a reality. There is a clubhouse, with gorgeous, oversize leather couches, fronted with arty tables made from horizontal slices from an enormous tree, left in their organic shapes and coated with a glossy shine. There's also a bar, but, other than for security, it's unstaffed. Image pilfered from Nawi Resort's website. Savusavu, Fiji. We chose this as Nawi Resort's best view lot. On a less overcast eve, the colors in these waters sparkle in turquoise. Savusavu, Fiji. We decided to walk the grounds while there was still light to do so. We picked out "the best lots," took in the best hilltop views and completed our circuit of the grounds. Lounging in Nawi Resort's clubhouse, listening to Steve's storytelling. Meaghan of Tangatatu, Patty (Steve's wife), and Chris of Tangatatu listen. Savusavu, Vanua Levu, Fiji. arty oversized coffee table. Savusavu, Fiji. 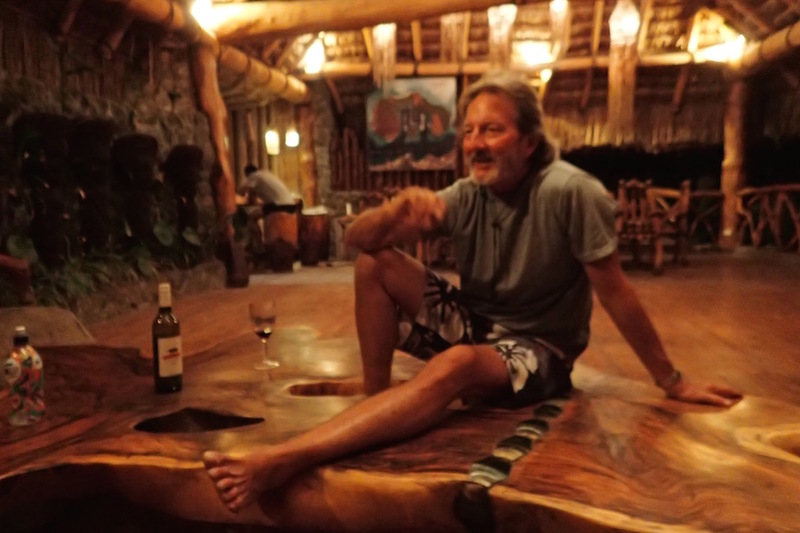 Then we returned to the clubhouse, got comfortable and drank to our dreams, those past, lost and found, getting fulfilled now, and, well, who knows? 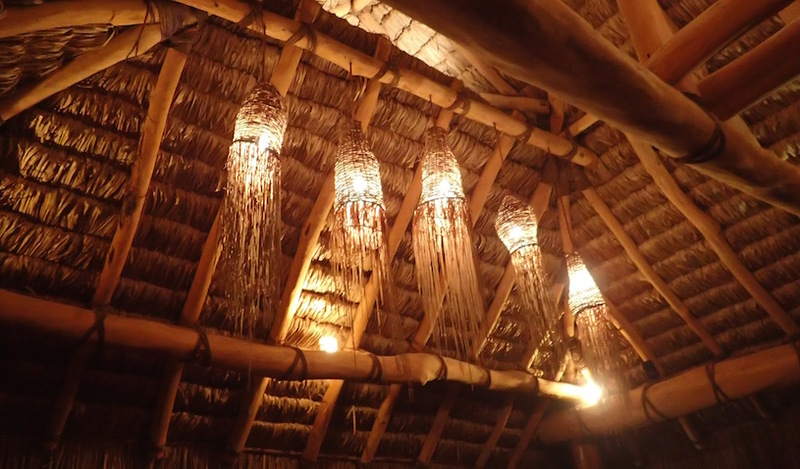 Nawi Resort's interior designer did a bang-up job on their clubhouse. I found these lights particularly cool. Savusavu, Fiji. With empty glasses and filled imaginations, we made our way through the darkness, across the water, back to our humble boat. Still, it's real. It's all paid for. It transports us to some awesomely cool places -- usually for free. For now, that works just fine for us. Any particularly memorable resorts you've crashed? Tell us about them! 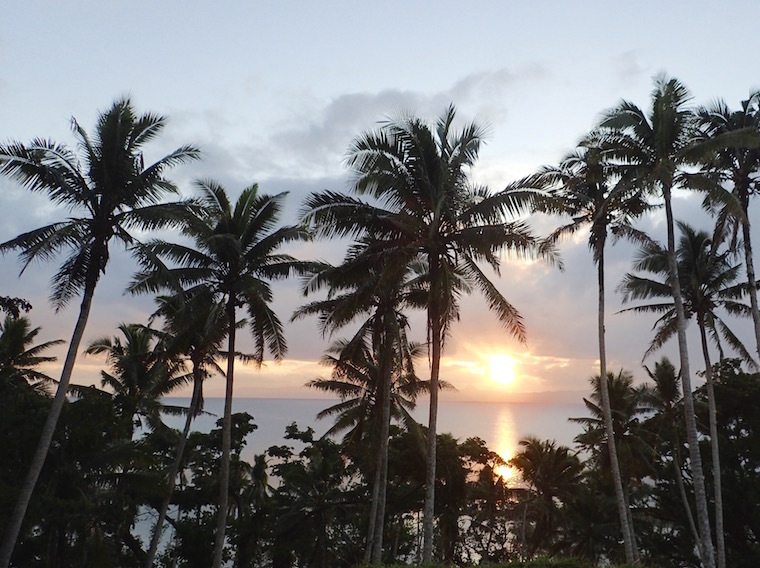 Palms slihoutted in this Savusavu sunset, viewed from Nawi Resort, Fiji. 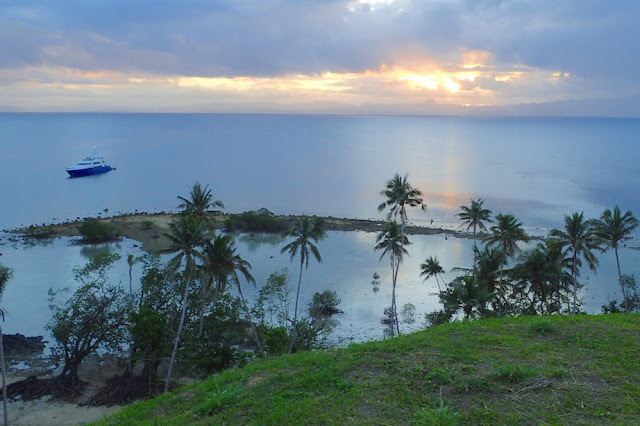 This post is a recent retrospective of our time moored off a Savusavu, on Vanua Levu, Fiji (S16.46.706 E179.19.785) June 24th - July 13th, 2016. We are currently moored off Vanuatu's Port Vila, Yachting World Marina, (S17.44.722 E168.18.726) readying to cruise Vanuatu. newcomers like us messing about in his neighborhood. Prior to that we sailed sailed from St. Lucia to Florida and also spent a season cruising the Bahamas. After Vanuatu, New Caledonia. After New Caledonia, Australia, by December 2016. There, we plan to sell our boat, and go back to work, somewhere.